¿Estás interesado en conocer gente de otros lugares y culturas? ¿Estás en buenas condiciones físicas y te apetece trabajar construyendo algo con tus manos? ¿Te gusta viajar y trabajar en equipo? Encuentra tu oportunidad con los campos de trabajo en Alemania. ¿Qué voy a hacer exactamente? Vivirás y trabajarás en equipos internacionales, con voluntarios de todas las partes del mundo. Ayudarás a organizaciones a construir o renovar. Puede ser un centro recreativo en un espacio natural, un centro para educación en la naturaleza, un asilo para mujeres o zonas rurales para ocio de niños con menos oportunidades. No te preocupes si no tienes experiencia en este tipo de actividades, simplemente trae ganas de aprender algo nuevo. Los fines de semana los tienes libres y te invitamos a descubrir las ciudades y pueblos de los alrededores. Seguro que te apetece ir a explorar con tus nuevos amigos del campo de trabajo. Estás en buenas condiciones físicas y te apetece trabajar construyendo algo con tus manos. Te gusta viajar y trabajar en equipo. Tienes un nivel básico de inglés. (Tu tienes que hacerte cargo del viaje desde España hasta el primer campo de trabajo y desde el último campo de trabajo hasta España). Envía un a contacto@viajealasosteniblidad.org correo y resolveremos todas tus dudas. PROJECT: “The House of Change” in Heinersdorf (East Brandenburg), about 60 km east of Berlin, is a young project supported by an association and a large circle of supporters. In the former vocational school, a place of encounter and solidarity is being created on 3000 square metres in 60 rooms. The house should be a bridge between town and country and at the same time bring together different areas of society. The plans include open workshops, a seminar and guest house, a multi-generation housing project, a free school, a day-care centre for children, a library, a culture café and much more. The house should be open for impulses, initiatives and encounters of and with inhabitants of the village and the whole region. Planned for the construction camp in spring, are the renovation of guest and seminar rooms, the installation of a kitchen, the construction of beds and, depending on the weather, the design of the garden. PROJECT: Since 2016, the association “Natürlich Lernen am Tollensetal e.V.” has been operating the now revitalised school country home, where school classes, youth groups, youth welfare institutions and families can experience nature. A forest kindergarten is to open there in mid-2019, where the children can spend the whole time outdoors. Nevertheless, they need a protected place. Therefore, two existing wooden bungalows on the nature experience site are to be converted into a shelter for the children. PROJECT: Olgashof is a living and working community near Wismar. Here, 14 adults and 9 children live together across generations in a large manor house and some outbuildings on a spacious site. What is important here is a hierarchy-free and appreciative coexistence and the experiment of everyday life beyond the consumer society. There are several workshops, an architectural office and a conference house on the site. The Bauorden has been supporting various projects at Olgashof for over ten years. In 2019 the manor house is to be extended by one storey. The interior design of the new floor and the adaptation of the house to the fire protection measures are therefore planned. The roof of one of the warehouses will have to be renewed and minor work on the school building and the conference centre is also planned. During the construction camp there will be several groups, which will be supervised by trained craftsmen. The “Grüne Schule grenzenlos” in Zethau is an international environmental centre in the Erzgebirge Mountains. The association offers children and teenagers as well as adults and seniors various opportunities to discover nature and become involved in its protection. Cross-border nature education projects, especially with partners in the Czech Republic, but also in other Central and South-Eastern European countries, play an important role. In recent years, two empty school buildings have been converted into an international educational and meeting place (also with the help of volunteers of Bauorden). A flax museum, a playground and an underwater biotope for teaching purposes complete the outdoor area. This year, the volunteers will build additional climbing elements for a playground, extend a willow pavilion and renovate rooms. PROJECT: The “artist city Kalbe” wants to remind people of their creative potential. It pursues a sustainable urban and regional development concept. The goals are to open up perspectives for staying of inhabitants, enable people to move in and improve the quality of life for the locals. In the five years of its existence, the artist city of Kalbe has been honoured and awarded 16 times for its extraordinary works. The organisation owns three buildings, all of which are to be rebuilt or dismantled. Also, a former farm in the middle of the old town will be converted into a residential centre for scholarship holders and should create space for approx. 20 residents. In addition, there is a former court, which is to become the centre of the artists’ city. During the construction camps, the front building of the future “culture yard” is to be restored. PROJECT: The association “Naturspur” is involved in ecological and educational projects in youth work and adult education. With children, parents and other interested people, natural playgrounds are developed and designed in a participative process. On a former sports ground in Otterstadt a nature experience area was created, which offers ideal conditions as an area for experiencing nature during various educational events. Emphasis is placed on ecological construction methods and the use of regional building materials. During the construction camp in spring, a model school garden is to be planned and laid out. For this purpose, raised beds, a tool shed, benches and work tables are to be built. Further tasks, which will be done in the spring and summer camp, are the dismantling of wooden huts, the new planting and setting of woods as a basic framework, the care of all horticulturally arranged surfaces, the sawing of firewood and the artistic design of existing building elements with paint and wood. The CVJM Berlin e.V. is a recognized provider of independent youth welfare services. Founded in 1883, it is the oldest YMCA in Germany. With their different offers, the association strives to help youngsters discover together their potentials, develop their personality and take over responsibility in the society. In the CVJM camp Storkower See (70 km from Berlin), an extensive forest area with a group house, campground and direct access to the lake, youth groups and school classes can spend their leisure time actively. The site is being continuously expanded, also during the two construction camps in 2019. In spring, the volunteers of Bauorden will mainly be doing carpentry work. A large seesaw, a platform between trees and a wooden trail will be built; a bungalow will be further developed. In addition, an interactive field game for primary school pupils and a biker course are to be planned and built. In summer, further carpentry work will continue: a footbridge system, outdoor furniture, another platform between trees and a roof truss made of logs will be built. The volunteers will also carry out demolition work in the sanitary area. Since its foundation in 1972, the “Christian Youth Village Wolfstein” has been active in various areas of child and youth welfare, the integration of migrants and vocational training. In various residential groups, help is offered for children and young people as well as for people with disabilities. One of the facilities of the CJD Wolfstein is the children’s house in Bedesbach, about eight km away from the district town of Kusel. Here, up to ten girls and boys between the ages of five and twelve are cared for. The aim is to reduce family burdens, to promote the development of children and young people, to enable them to attend school successfully and, if possible, to return to the family. The care should offer the children and young people security, a sense of security and reliable relationships in addition to their orientation towards everyday life and the world in which they live. 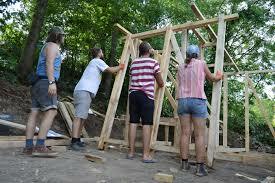 During the construction camp, an open stable for keeping mini goats will be built for the children’s house in Bedesbach and the enclosure will be designed together with the participants of the workcamp. as people with and without disabilities. During the construction camps in 2019, a house facade will be painted and several tipis made of wood will be built. Dear Sir/madam. We are school teachers from north Israel, and interested in bringing our students to intercultural and educational activities in Europe during July and Augusy. If you have something that may interest us, please let us know.